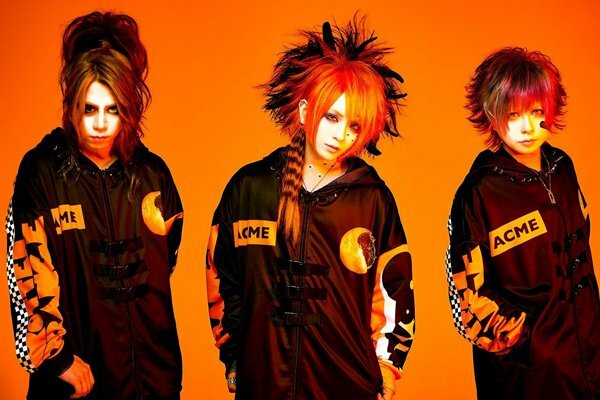 Visual Kei band ACME was formed in summer last year by vocalist CHISA and guitarist SHOGO. With both members we already had an interview when they were active with their former band DIV, so we are happy they as well as ACME's drummer HAL took the time again to answer our questions - now that they have formed a new band and have much to tell us about! The fourth member of the band, bassist RIKITO, is currently taking a break from band activities in order to focus on improving his health. On March 9th, 2018 ACME is planning to release a brand new single titled "ROTTEN ORANGE". We wanted to know more about it and also about how the band actually formed. Read the answers to these and more questions below! JPA: This is the first time we interview ACME as a band. Please introduce yourself first and tell us a place or city in Japan where foreigners definitely should visit when travelling to Japan. CHISA: I’m vocalist CHISA. I’m working on lyrics, music, costumes and the production of our goods. If you come to Tokyo I want to recommend “Asakusa”. It’s a place where the old and the new Japan co-exist at the same place. You can also see the Sky Tree, so that’s very nice. SHOGO: Tokyo. It’s our capital and whatever it is, you can find it there. HAL: I’m drummer HAL. My trade mark is Pandas. The place I recommend going to is Akihabara. It’s a place where you can find a lot of Anime, Idols and the “kawaii” that Japan is famous for. If you go to a Maid Café you can experience an atmosphere that you can’t experience anywhere else in this world. In Japan you call that “Moe”. JPA: What does your band stand for and what's the concept of it? CHISA: It’s the “delinquent JAPANESE”. I think it’s easy to understand if you think of it as the image of juvenile delinquents the way they also appear in the Japanese Anime “JoJo's Bizarre Adventure”, “SLAM DUNK” or “GTO”. We use parts of Visual Kei, Metalcore and EDM but sound-wise our music is heavy. We’re creating our music so that you can hear it clearly and without any static noise. HAL: It’s about juvenile delinquents that are living in another world. We’re expressing the insecurity in the hearts of young people, imperfect ideologies and gratuitous self-confidence. SHOGO: It’s about imaginary juvenile delinquents. JPA: What is the reason for choosing the band name “ACME”? SHOGO: Because it has punch. HAL: We wanted to let the band name start with “A” and “ACME” was the word that had the best punch! People do object that it has too much punch but it’s really special if people can get excited over a band name like this. That’s why we decided for this name. CHISA: In Japan this word doesn’t really deliver a good impression but it’s like we said before – it’s “delinquent”. JPA: SHOGO and CHISA, you already knew each other from your former band but how did you come to know the other members? CHISA: We sometimes met DEZERT’s SORA at the studio and he introduced us to HAL. When we met for the first time we had some drinks and talked. It turned out that we wanted to do something together. For a new bassist there were so many people who came to an audition but we couldn’t really decide. RIKITO was introduced to us by an acquaintance. We were really interested in his technique, so he came to the studio, we played together and decided for him. HAL: CHISA and SHOGO were planning on forming a new band and were searching for a drummer. They heard the rumour that a legendary drummer is homeless now and found me. SHOGO: I was in the same band with our vocal CHISA but bassist RIKITO and drummer HAL were in bands of a different genre. They were introduced to us by an acquaintance. JPA: Before forming ACME CHISA and SHOGO were holding lives together as session band “CHISA & SHOGO”. Why did you decide to form a proper band again? SHOGO: Before starting with CHISA&SHOGO we talked about our thoughts and decided to start a new band together again. While searching for members we were active as CHISA&SHOGO. CHISA: Actually, even if the members had changed, SHOGO and I didn’t want DIV to disband. But due to various reasons this wish didn’t come true. The feeling that we wanted to be in a band together hasn’t changed. We’ve created songs together, so as guitarist and vocalist we have a feeling of connection to each other. JPA: Currently RIKITO is on hiatus and you are performing with various support bassists. How is it to hold concerts like this? HAL: It’s a good experience to listen to our songs with a fresh style – songs we used to perform as taken for granted. UNiTE.’s haku-kun even shows up in our MV. I’m really thankful towards everyone with all my heart. We have to return this favour one day. SHOGO: It feels fresh. Just by the musician being a different one the way you listen to it and the groove are different. That’s fun and it’s a new experience. But in the end, RIKITO’s sound is the best, I think. CHISA: We worried everyone. Still, I’m really happy because there are many people who helped us. JPA: Talking about your new single, what kind of CD is ROTTEN ORANGE? Why did you decide for “Orange”? CHISA: In Japan there’s the expression “equation of rotten oranges”. It means that if there is only one rotten orange in a basket of oranges then all the others will slowly rot too. You also use this in school. If there is one delinquent person the others will stray from the right path as well. I wanted to write about this and so we’ve created ROTTEN ORANGE. HAL: ACME has released quite a range of songs of different genres until now but ROTTEN ORANGE will be an extremely aggressive one. It develops dramatically from a very fast A-Melody into a melodious chorus. It’s a song only ACME can play with its high ability of performing. SHOGO: Among ACME’s fast songs this is a really loud&catchy one. We could create a really good song regarding quality and the volume balance of the instruments. JPA: In many bands only the vocalist writes the lyrics but in ACME all of the members do that. Did you decide this right in the beginning when forming the band? HAL: We did. This is one band consisting of four people, that’s why it’s just normal that all members write lyrics. When four people come together, four ways of thinking are being born. SHOGO: By chance all of the members write lyrics. Because we all have individual characters we decide who writes which song’s lyrics after we’ve decided on the songs we want to record. CHISA: I think, the same time we are performers we also have to be artists. You can’t say you express yourself only by playing your instrument. I think it’s important to think about how you can express your feelings. It takes quite some time to understand how to express your feelings with a song you haven’t written by yourself. It’s difficult but when you write a song it happens by nature that the song gets filled with your feelings. JPA: CALL MY NAME is the title song of the movie “namae no nai onnatachi usotsuki onna”. Did you already watch it? How was it? HAL: I haven’t watched it yet. SHOGO: I haven’t watched it yet but I want to watch it and listen to CALL MY NAME in the cinema. CHISA: When we got the offer I took a look at the script and wrote lyrics and composed the song. I think it goes really well with the movie. JPA: In summer you will have your 1st anniversary. Did you already decide how to celebrate it? HAL: There will be our 1st anniversary oneman live “PKPK no ichinensei” (PKPKの1年生) at TSUTAYA O-WEST. It will be our first oneman, so I want to create a world only ACME can create. At the events we performed until now we couldn’t stand on stage for a long time, so I think it will be great to decide on the set list for a oneman live. The variety of our compositions and things our members can do is so huge. It was important to find out how far we can go with that and how we can bring all this together. SHOGO: This oneman will take place on May 5th. CHISA: I’m really looking forward to this live! JPA: What are ACME’s goals in 2018? HAL: This year we also have a oneman live. I want more and more people to like ACME. And it would also be nice if we don’t only reach Japanese fans but also expand abroad. SHOGO: If possible I’d like to hold a live abroad! CHISA: I also want to hold a live abroad! And if we can’t hold a live there I’d like to go in private at least. JPA: In the end, please send a message to our readers! HAL: Our story hasn’t ended – actually it has just begun. We don’t know what will happen next. I think there will be good things and bad things but with these four people we will overcome them, so please treat us well! When you get the chance to go to Akihabara, please also come to our concert! SHOGO: If we can hold concerts in your countries, please definitely come! And also show ACME around among your friends! CHISA: Please treat us well. I will give my best to return all your love! JPA: Thank you very much for this interview. We wish you all the best and RIKITO a quick recovery! Source: Special thanks to the band for this interview! ACME to Release 4th Single "Houkago no Shiiku"